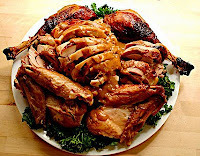 Technique of the Week: Carving (a Turkey) | We Like to Cook! First, you will need a carving knife with a sharp, flexible blade designed to follow the contours of the bird. A two-pronged fork will help to steady the turkey. A boning knife is useful for cutting through joints and removing the legs and wings. Choose a cutting board with a perimeter well to capture the flavorful juices of the bird, if possible. Reserve these juices and any scraps for making your gravy. Tent the roasted turkey with aluminum foil and let it rest for 20 to 30 minutes. If you start carving too early, the juices from the bird will run all over the place and your turkey will dry out. Also, letting the turkey rest and cool will reduce the chances you’ll scald yourself with delicious but molten hot turkey juice. Resting allows time for some of the juices to be absorbed back into the meat, making it moister and easier to carve. If you trussed the turkey, snip and remove the trussing twine with a pair of kitchen scissors, and then carefully remove the string from around the bird. If you used skewers to hold the cavities closed, remove these as well. If you stuffed the turkey, scoop the stuffing from the cavity with a long-handled spoon and place in a serving dish. 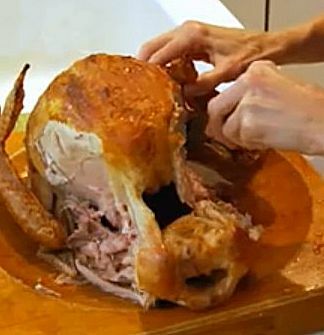 If necessary, you can make an incision at the neck of the turkey to reach into the cavity from that side to remove the remainder of the stuffing. Now it is time to start carving the bird. You'll start by removing the leg and thigh from each side of the turkey. Cut through the thin layer of skin holding the thigh to the body of the turkey until you see the hip joint. Insert your knife tip into this hip socket and cut to sever the whole leg from the body. Carve around the joint until you don’t get any resistance. Pull the leg and the thigh away from the body of the turkey all in one piece. Repeat this process on the other side. Now to separate the drumstick from the thigh, cut between the two until you reach the joint. Gently feel with the knife until you find the seam between the drumstick and thigh at the joint, then cut through. It may help to pull the two apart until you can see the joint before cutting through it. You can serve the drumsticks whole or slice the meat off them. To slice, secure the drumstick with the fork and slice the meat lengthwise along the bone, turning after each slice. To slice the thigh meat, place the thigh, flat side down, and slice the meat parallel to the bone. Once exposed, the bone can be easily removed and discarded. Now it's time to remove the wings. Just like removing the thighs, you can gently pull on the wing and easily cut down to the ball joint that attaches it to the body. Probing with the point of the knife, find the joint and twist the knife while gently pulling on the wing until they separate. You may need to slice through some tendons once the joint is separated in order to pull the wing free. The wings can be served whole. Now you're ready to slice the breast meat. Locate the breastbone at the top and center of the breast, and make a deep horizontal cut through the skin and carve downward to remove all of the breast meat from one side of the bone in one single piece. Repeat this procedure on the other side of the turkey. Arrange all the meat on your serving platter, placing dark meat on one side and white meat on the other. You can put your stuffing in the middle if desired. Garnishes of kale, parsley, cranberries, or other small seasonal fruits and vegetables add color to the platter as well. Be prepared for applause when you serve your perfectly carved turkey. Nice recipe! Thanks for sharing..